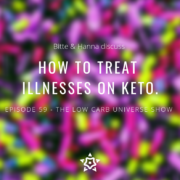 Today, Bitte and Hanna discuss how they’ve changed their views on treating illnesses, such as the common cold, before and on keto. how their first treatment of illnesses has changed, and how they differ from each other! What supplements does Hanna take to combat early signs of illness? What does Bitte drink? Why does Bitte think it’s fun to go to the doctors? What’s the deal with Keto Crotch?! Welcome to this week’s thrilling episode of The Low Carb Universe Show! * Please note that there certainly are cases where medicine and pharmaceuticals are very much needed (just listen to the episode!). What is your attitude to treating illnesses? Has it changed through low carb? Leave a comment!